David Mead (born David Moore on 4 November 1988) is a Papua New Guinean professional rugby league footballer who plays as a wing or fullback for the Catalans Dragons in the Super League. A Papua New Guinea international, New South Wales Country Origin and World All Stars representative, he represented his country at the 2008, 2013 World Cups and was the PNG Kumuls' captain for the 2017 World Cup. Mead previously played in the National Rugby League for the Gold Coast Titans and the Brisbane Broncos. Born in Port Moresby, Papua New Guinea as David Moore on 4 November 1988, Mead moved to Australia as a 12-year-old where he attended Kadina High School and Trinity Catholic College in Lismore, New South Wales. Mead played junior football with Lismore Marist Brothers before being signed by the Gold Coast Titans. Mead played for the Titans NYC team in 2008. Mead was named in the Papua New Guinea squad for the 2008 Rugby League World Cup. Between the 2008 World Cup and the 2009 NRL season, Mead changed his surname to honour his aunt's family who raised him after moving to Australia. On 30 January 2009, Mead signed a contract extension with the Gold Coast Titans after turning down an offer from the Sydney Roosters. In Round 13 of the 2009 NRL season, Mead made his NRL debut for the Titans against the St. George Illawarra Dragons off the interchange bench in the Titans 28-24 win at Skilled Park. In his next appearance in Round 16 against the New Zealand Warriors, Mead made his first appearance in the starting line-up, scoring his first and second NRL career tries in the Titans 28-12 win at Skilled Park. Mead finished his debut year in the NRL with 14 matches and 8 tries. 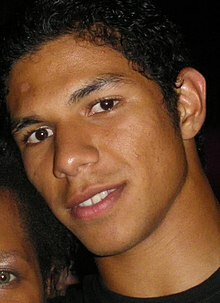 He was part of the Papua New Guinea squad for the 2009 Pacific Cup, and was named their player of the year by the Rugby League International Federation. A regular on the wing in 2010, Mead was one of the club's leaders in many statistics before a foot injury saw him miss the rest of the season from Round 16 onwards. Mead said, "It is pretty frustrating because I have worked so hard and to get halfway through the year now and it is all just gone, just like that." In Round 12 against the Sydney Roosters, Mead scored a hatrick of tries in the Titans 30-16 loss. Mead played in 15 matches and scored 6 tries during 2010. Despite the Titans poor record in 2011, Mead played in every match and was the club's top tryscorer with 16 tries from 24 appearances. In Round 22 against the Cronulla-Sutherland Sharks, Mead scored what some considered the best try of the year when he collected a Scott Prince cross-over kick on the fly behind his back one handed to score in the 20-16 win at Toyota Stadium. Assistant coach Steve Murphy said, "I can't believe he caught that ball. It was just one of those freak things, those amazing things. He's got those in him, Dave." Mead played in 20 matches and scored 10 tries for the Titans in the 2012 NRL season. On 6 December 2012, Mead extended his contract with the Titans for 4 years till the end of the 2016 season. In Round 23 against the North Queensland Cowboys, Mead became the first Gold Coast Titans player to score 50 tries for the club during their 22-10 loss at 1300SMILES Stadium. Mead played in 16 matches and scored 11 tries in 2013. In October, Mead represented Papua New Guinea in the 2013 Rugby League World Cup, playing in all 3 matches at fullback. In January, Mead was selected for the Titans inaugural 2014 Auckland Nines squad. Mead was selected for the Country Origin team in the annual City vs Country Origin match after sorting out his eligibility for New South Wales. Mead played at fullback and scored 2 tries in the 26-26 all draw in Dubbo. In Round 11 against the New Zealand Warriors, Mead played his 100th NRL career match in the 24-16 loss at Cbus Super Stadium. Mead finished the 2014 NRL season with him playing 18 matches and scoring 4 tries, his worst try-scoring effort to date. Mead was again a member of the Titans' Auckland Nines squad. He also returned for New South Wales Country, playing at fullback and scoring a try in their 34-22 win at Wagga Wagga. In Round 25 against the St. George Illawarra Dragons, Mead eclipsed Kevin Gordon's record as the Gold Coast Titans all-time highest try-scorer with 60 tries, overtaking Gordon's 58 tries for the club by scoring 2 tries in the Titans 28-26 win at Cbus Super Stadium. He scored 5 tries from 22 matches for the 2015 NRL season. On 29 January 2016, Mead was named in the Titans 2016 Auckland Nines squad. On 7 May 2015, Mead captained Papua New Guinea in the 2016 Melanesian Cup Test against Fiji, where he played at fullback in the 24-22 win at Parramatta Stadium. On 10 September 2016, it was announced that Mead would sign with the Brisbane Broncos from 2017 on a one-year deal. Mead finished his last year with the Gold Coast Titans with him playing in 18 matches and scoring 7 tries in the 2016 NRL season. On 14 December 2016, Mead was named in the World All Stars team on the wing to play against the Indigenous All Stars on 10 February 2017. On 10 February 2017, Mead played for the World All Stars against the Indigenous All Stars in the 2017 All Stars match, playing at fullback and scoring a try in the 34-8 loss at Hunter Stadium. On 18 February 2017, Mead made his Broncos debut in the 2017 World Club Series match against the Warrington Wolves where he started on the wing and scored a try in the 27-18 loss at Halliwell Jones Stadium. At the start of the 2017 season, Mead was languishing in the Queensland Cup playing for the Wynnum-Manly Seagulls after coach Wayne Bennett opted to shift Jordan Kahu to the wing and put Broncos new recruit Tautau Moga at centre leaving Mead out of the starting backline. In Round 6 of the 2017 NRL season, Mead made his first appearance in the NRL for the Brisbane Broncos against the Sydney Roosters, filling in for an injured Corey Oates on the wing and scoring a try in the 32-8 win at Suncorp Stadium. On 21 April 2017, Mead extended his contract with the Broncos to the end of the 2018 season and also on the same day in Round 8 against the South Sydney Rabbitohs, Mead played his 150th NRL career match in the Broncos 25-24 win at ANZ Stadium. 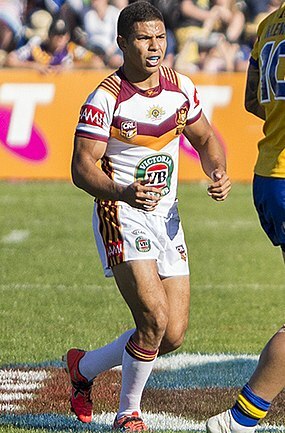 Mead finished his year stint at the Brisbane Broncos with him playing in 12 matches and scoring 3 tries in the 2017 NRL season. On 4 October 2017, Mead was named as the Captain of the Papua New Guinea 24-man squad for the 2017 Rugby League World Cup. Mead played in all 4 matches at fullback and scoring 4 tries for the Kumuls, having a great tournament by starting with scoring a hattrick of tries in the 50-6 demolishing win against Wales in Port Moresby. On 12 December 2017, Mead announced that he had signed a 3-year deal with the Catalans Dragons in the Super League, starting in 2018. ^ a b c "Players - Love Rugby League". Loverugbyleague.com. Retrieved 4 October 2017. ^ "David Mead - Career Stats & Summary". Rugby League Project. Retrieved 4 October 2017. ^ a b Mascord, Steve (3 May 2013). "MEN OF THE WORLD Two: DAVID MEAD (Papua New Guinea & Australia)". Stevemascord.com. Retrieved 4 October 2017. ^ Blomberg, Matt (4 June 2010). "Mead on Raider alert". Northern Star. ^ "Wilshere handed Kumuls captaincy". BBC News. 14 October 2008. ^ Marshall, Matt (30 January 2009). "David Mead, Esi Tonga, Kevin Gordon stay at Coast". Courier Mail. ^ "Titans Youngsters Stay Loyal". Daily Telegraph. 30 January 2009. ^ Clark, Laine (8 June 2009). "Titans Defeat Illawarra 28-24". Fox Sports. ^ Herning, Wayne (27 June 2009). "Young Guns Inspire Depleted Gold Coast Titans to Big Win over Warriors". Fox Sports. ^ mlipen (11 October 2009). "Kumuls Named". The National. ^ "PNG and Fiji finalise squads for Pacific Cup". NRL.com. 19 October 2009. ^ Webster, Andrew (10 November 2009). "Hayne Named Player of the Year". Daily Telegraph. ^ Nicolussi, Christian (1 June 2010). "Sydney Roosters beat Gold Coast Titans 30-16 in NRL round 12 match". Courier Mail. ^ Rayner, Tristan (7 August 2011). "David Mead scores incredible NRL try". The Roar. ^ titans.com.au (6 December 2012). "Mead re-signs with Titans until 2016". Zero Tackle. ^ Badel, Peter (18 August 2013). "North Queensland Cowboys beat Gold Coast Titans 22-10 in NRL round 23". Daily Telegraph. ^ Meyn, Travis (22 January 2014). "Gold Coast Titans to unleash their best team against the Auckland Nines". Gold Coast Bulletin. ^ Badel, Peter; Meyn, Travis (30 April 2014). "David Mead a Kumul chameleon after the Papua New Guinea international changes eligibility". Courier Mail. ^ Toohey, Barry (4 May 2014). "Hulking Centre Jamal Idris Stars in Thrilling City/Country Draw". Daily Telegraph. ^ Balym, Todd (24 May 2014). "Dave Taylor shines as Gold Coast Titans keep sinking following loss to Warriors". Courier Mail. ^ Luca, Rocco (20 January 2015). "Titans name 2015 nines squad". Rugby League Week. ^ "Representative Round team lists". NRL.com. 3 May 2015. ^ Brady, Jack (3 May 2015). "Country overcome City in seesawing affair". NRL.com. ^ Meyn, Travis (24 July 2015). "Gold Coast Titans duo Kevin Gordon and David Mead want to avoid another wooden spoon". Gold Coast Bulletin. ^ Lutton, Phil (30 August 2015). "Dave Taylor enigma continues as Gold Coast Titans upset St George Illawarra Dragons". Sydney Morning Herald. ^ Luca, Rocco (29 January 2016). "Titans unveil 2016 nines squad". Rugby League Week. ^ Campton, Nick (7 May 2016). "Papua New Guinea hold on to upset Fiji in Pacific Test thriller". Daily Telegraph. ^ "David Mead: Why I chose the Broncos". NRL.com. Retrieved 5 December 2016. ^ "NRL All Stars squads: World All Stars line up, Indigenous All Stars line up". Fox Sports. 14 December 2016. Retrieved 4 October 2017. ^ "Rough start for Nine's new footy host". News.com.au. Retrieved 4 October 2017. ^ "Broncos' loss to Wolves creates history". Couriermail.com.au. Retrieved 4 October 2017. ^ "Warrington 27-18 Brisbane: Wolves' first-half blitz stuns Broncos". Sky Sports. 19 February 2017. Retrieved 6 April 2017. ^ "World Club Series: Warrington Wolves 27-18 Brisbane Broncos". BBC. 18 February 2017. Retrieved 30 April 2017. ^ "Broncos Defeat Roosters 32-8; Five Things We Learned". Couriermail.com.au. Retrieved 4 October 2017. ^ "Mead re-signs with Broncos". M.nrl.com. Retrieved 4 October 2017. This page was last edited on 3 March 2019, at 12:55 (UTC).